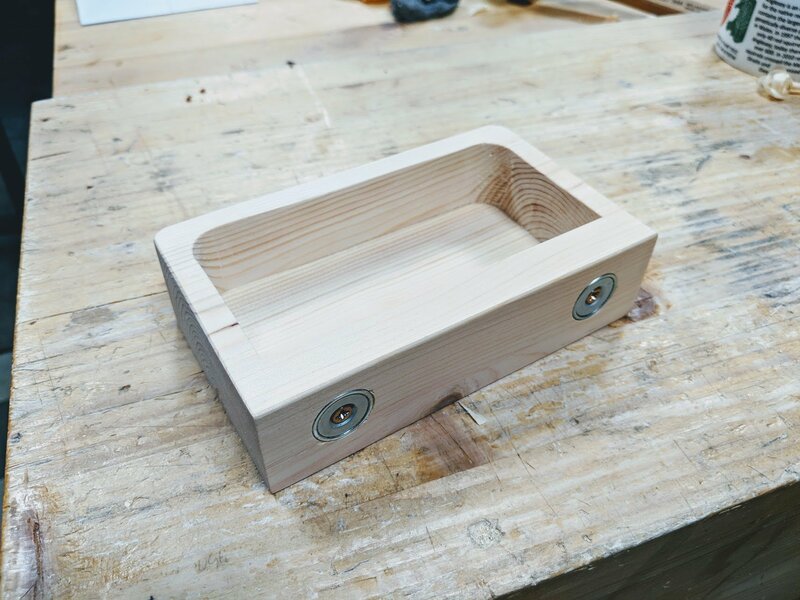 I did the bandsaw box tray exercise to fly in the face of the man who said, “I don’t mind you using a bandsaw in your videos so long as you don’t make another of those bandsaw boxes!” Today I made one by hand minus the bandsaw because I could. Was the bandsaw and the hand brace slower? I didn’t time it. A little. Not much. I turned it out in under an hour. Is it quicker than dovetailing the corners and using conventional methods? Not really. About the same. I cut my block to size and started by ripping the 7/16″ bottom off. I used a newly sharpened tenon saw and could have used a handsaw so I would not have needed to work from both ends but I was fine really. I planed up both faces very quickly. I eyeballed my 7/16″ in from each end and along the front edge and my 11/16″ along the back edge. I set a gauge up to 3/8″ from the inside lines delineating the inside walls of the box. I then made cross hairs to the front corners and these give me the centre of a 3/4″ brace bit. I marked both sides so I could bore from both side. I used an awl to deepen the point to start my boring with. I bored half way through from one side and then turned round to bore from the opposite side. Yes, they met dead on. I cut down the back line to remove the 11/16″ back piece. I planed the two meeting surfaces. I used a knife to delineate the cut lines at each end. This knifewall is on both sides and the back edge. That way there is no fraying when I cut with the saw. I sawed down the end lines with the tenon saw. I drew a cut line diagonally from the corner to the hole as shown as a guide. I cut along the cut line to the hole. I drew a second guide line for a second diagonal cut into the hole. Chisel down the bulk of the waste gradually…go carefully and a little at a time. If you have a rasp, refine to the cut line. If not, get as close as you can and refine with sandpaper and a block of wood. Refine the inside corners with sandpaper wrapped around a dowel. Glue the front section of the box to the base and then add the back piece and glue that. Make sure all parts align well before cinching tight. Clamp with even pressure watching for any slippage as you do so. Once dry remove the clamps and plane up the outside of the box. Refer to the bandsawn version in the previous blog post for final shaping and finessing here. Side by side I would defy anyone to tell the difference between the hand made one and the machine made one. I used a brace and bit to bore the holes for the magnets but being so near to the end the wood could easily split because the threaded part is quite stubby and wide at the base. I suggest you either clamp across the wood to stop it splitting or do as I did and drill a 1/8″ pilot hole to relieve the pressure on the wood and then go in with the bit and brace. The bored recess is uneven because of the nature of the bit brace. I used a 1/4″ chisel bevel down to refine the depth. The magnet requires only a 1/2″ screw to secure but you could also glue it in place with epoxy. The unbandsawn tray box is ready for shellac. Haha. I was so expecting a coping saw to appear for that final cut, and it never did. whew! After that last post, I had thought you went over to the dark side! Now why oh why did I not think that one up???? Haha, this post and the one before it, “An Exercise Project For the Bandsaw,” started my day out right with a good laugh. Prime example of not letting anyone tell you what type of woodworker you should be, and the fact that the precision with hand tools is equal to the task of machines is the cherry on top of the cake, don’t know why anyone puts cherry’s on the top of their cakes though, they belong in pies ;). I never yield to bullies no matter their tactics and methods of bullying. Am I the only one who thinks the triangular piece on picture 18 looks like a cartoon piece of cheese? Maybe Paul could carve a little mouse (without stepping on Mr Thompson’s toes) to go with it. Bravo. Well said, both of you! Intended for Mike and Paul, two-three posts above! That design is probably easiest to execute with a power router and simple template…. maybe a third installment of this ‘bandsaw’ box Paul? Joking apart, it’s really refreshing to see projects constructed entirely with hand tools. Excellent! Just for fun did you time yourself to compare both methods? All of this is beginning to prove how I feel about recent blogs and reactions. Thinking back when this all started (2011? ), the comments were more about woodworking and not personal issues. So, with that said I like the simplicity of the box design. Dovetails don’t always have to be used although that’s the primary type of joinery I use for boxes. Nice to see an alternative.